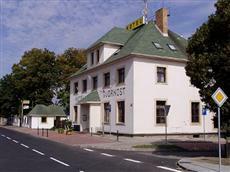 The hotel Svornost is situated close to the highway crossing at Hradec Kralove, Liberec a Brno, only 15 minutes from the historical centre of Prague. It is located in a quiet area of Prague, offering peace and total relaxation, away from the bustle of the city. The rest of Prague lies at your feet thanks to the fantastic public transportation service. Near the hotel lies Sazka Arena, Prague's homeground in Letnany, T-Mobile Park and other sporting playgrounds for football, volleyball, basketball and tennis. In the surroundings you can find the chateau park with Prague's biggest pond and a Hummer centre test track for US-military vehicles. Besides the 21 beautiful guestrooms, the hotel also features a restaurant, a bar, a large summer terrace and a number of meeting spaces to host any exhibition, reception or business meeting.